Kolimechkov, S., Petrov, L., Alexandrova, A., & Cholakov, K. (2018). BeepShuttle Junior: Software for the Administration of the 20m Shuttle Run Test in Children and Adolescents. Journal of Advanced Sport Technology, 1(3), 35-40. 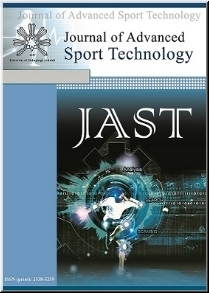 The Journal of Advanced Sport Technology (JAST) is an international peer-reviewed academic journal that aims to establish a stronger connection between industrial and academic research, and enhance communication between athletes, coaches, engineers, scientists, biomechanists, managers and administrators involved with leading edge sports technology research and development. BeepShuttle Junior is our new software, which assesses the aerobic fitness of children and adolescents based on age- and gender specific international norms. The software was originally presented at the 12th FIEP European Congress in Luxembourg, in 2017. After this Congress, the study was built upon further and the complete article was accepted in the Journal of Advanced Sport Technology, and it is now available for download on this page. The 20m shuttle run test (20mSRT) is applied for assessing cardiorespiratory fitness, and is included in many fitness test batteries, such as Eurofit, Alpha-fit, FitnessGram, etc. The aim of this study was to validate software, specially designed by us (BeepShuttle Junior), which administers the 20mSRT, calculates the maximal oxygen uptake (VO2max) in children and adolescents from 6 to 17 years of age, and classifies them in accordance with comprehensive gender- and age-specific international norms. This software supports the administration of the 20mSRT with an appropriate animation and audio signals. The most recent VO2max reference standards were combined in order to assess cardiorespiratory fitness. The results can be exported in an Excel compatible CSV file for additional analyses. A total of 63 children (31 girls and 32 boys) from London, aged from 6 to 9, were tested with the BeepShuttle Junior software, which calculated VO2max and percentile scores for each child. The boys performed significantly better than girls in cardiorespiratory fitness (47.7 ± 3.1 vs 45.9 ± 2.2 ml/kg/min respectively, p < 0.05), but the mean percentile scores for boys and girls were similar (53.2 ± 23.6 and 53.9 ± 22.1 respectively). 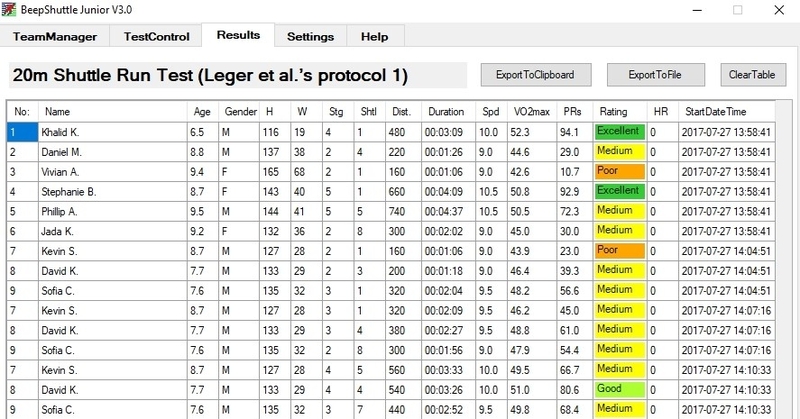 This software computes the percentile score for the exact age (years, months) and the exact VO2max of each participant by linear interpolation. The individual results and assessments completely matched the interpolated normative data tables. Cardiorespiratory fitness is one of the most important components of physical fitness, and refers to the ability of the circulatory and respiratory systems to supply enough oxygen for working muscles during sustained physical activity . From the health prospective, a good level of cardiorespiratory fitness has been shown to reduce clinical risk factors for cardiovascular disease and metabolic syndrome in children and adolescents . A systematic review, which includes numerous longitudinal studies , provides strong pieces of evidence that a higher level of cardiorespiratory fitness, both in childhood and adolescence, is associated with a healthier cardiovascular profile and with a lower risk of developing cardiovascular diseases later in adulthood. Although many terms have been used in the literature to describe this component of physical fitness, e.g. cardiorespiratory fitness, cardiorespiratory endurance, aerobic fitness, maximal aerobic power, aerobic work capacity, and physical work capacity, they are all applied interchangeably for practical purposes . The most valid measure of cardiorespiratory fitness is the maximal oxygen uptake (VO2max), which reflects the capacity of the heart, lungs, and blood to transport oxygen to the working muscles, and the utilization of oxygen by the muscles during exercise. The VO2max is expressed in absolute (litres of oxygen per minute (L/min)) or relative terms (relative to body weight in millilitres of oxygen per kilogram body weight per minute (ml/kg/min)) . The rate of aerobic metabolism and oxygen uptake increases as the intensity of physical exercise increases up to the point at which the aerobic capacity is reached. Beyond this point, VO2max no longer increases proportionally, even though exercise intensity can be increased, and there is a plateau in the relationship between the rate of oxygen uptake and exercise intensity . In a laboratory setting, the VO2max of children can be accurately obtained by using either the treadmill or cycle ergometer ; however, this requires expensive equipment and qualified technicians. It is also time-consuming, requiring about 30 minutes for the administration of the test for just one person. Therefore, the direct measurement of VO2max is not possible or practical for most field settings, such as schools or sports clubs, where large numbers of people must be tested . On the other hand, field-based tests for estimating VO2max are easy to administer, involve minimal equipment, have a low cost, and can be utilized on a larger number of participants over a period of time (Romero et al., 2010). The 20m shuttle run test (20mSRT) has probably been the most widely used means of assessing the cardiorespiratory fitness of children and adolescents [5-8], and is part of the most extensively applied health-related fitness test batteries, such as Eurofit , Alpha-fit , FitnessGram , PREFIT  and ASSO-FTB . The 20mSRT appears to encourage maximal effort by children, and the prediction of aerobic capacity from its results is valid for overweight and obese children, as well as those of normal weight . The 20mSRT was first described by Luc Léger  with the original 1-minute protocol, which starts at a speed of 8.5 km/h, and increases by 0.5 km/h each minute. Other variations of the test have also been developed, where the protocol starts at a speed of 8.0 km/h and with either 1 or 2-minute stages, but the original protocol is nevertheless recommended . During the test, children run between two lines, which are 20 meters apart, in time with an audio signal. The test finishes when a child fails to reach the end lines simultaneously with the audio signals on two consecutive occasions; otherwise, the test ends when a child stops due to fatigue . Values of gender- and age-specific norms for the 20mSRT in European children (6.0 – 9.9 years old) have recently been published for the first time , and although norms in European adolescents (12.5 to 17.5 years old) can also be found , there is still a gap between 9.9 and 12.4 which has to be filled in order to establish a comprehensive set of European norms. The administration of the 20mSRT and the accurate assessment of its results, however, might lead to some difficulties; for instance, it is hard to follow the shuttles and the speed for each individual properly when using only audio signals. Moreover, some test batteries, such as Alpha-fit and ASSO-FTB, do not refer to VO2max, but only to the completed stages of the 20mSRT, which is not an appropriate way to compare results from different studies. Furthermore, the reference standards of the 20mSRT have gaps in their values for younger children, which makes it more difficult for assessment purposes. The creation of valid software to facilitate the implementation of this test would make it easier to assess the cardiovascular status of each individual. The aim of this study was to validate software, specially designed by us (BeepShuttle Junior), which administers the 20mSRT, calculates the VO2max in children and adolescents between the ages of 6 and 17, and classifies them in accordance with comprehensive gender- and age-specific international norms. A total of 63 children (31 girls and 32 boys) from London, aged from 6 to 9, voluntarily participated in this study, which was conducted in 2016. The school review board approved this research prior to the tests, and a consent form was signed by the parent/guardian of all participants before they took part. The standing height of the children was measured to the nearest 0.1 cm with the Leicester Height Measure, which is recommended by the Child Growth Foundation and has been used in the UK’s National Child Measurement Program . Body weight was measured to within an accuracy of 0.05 kg with an electronic scale, and the BMI was calculated as: weight in kilograms / height in meters squared. The Z-scores and percentile scores for weight, height and BMI of each individual were calculated and assessed by using specialized software of the World Health Organization, called ‘WHO Anthro Plus’ . For the purpose of this study, we designed specialized software  to improve the assessment and efficacy of the 20mSRT in children and adolescents. All participants performed the 20mSRT and were tested with the BeepShuttle Junior software. The test was performed in the junior playground at St Edmund’s Catholic Primary School after a short general warm-up. Children were wearing their PE uniform (T-shirts, shorts and plimsolls) and practised the test to familiarize themselves with it. During the test we followed the standard procedure, and only one trial was performed . ‘Speed’ in the above equation is the running speed of the final completed stage (km/h), and ‘age’ refers to the age at last birthday. This equation was reported to provide an SE (standard error) estimate of 5.9 ml/kg/min or just 12.1% in a sample of 7000 children and adolescents from Québec between the ages of 6 and 17 , and was applied for the most recent international and European reference standards [7, 15]. In order to assess children’s VO2max, we adopted the most comprehensive and up-to-date available set of gender- and age-specific international norms for the 20 m shuttle run test in children and adolescents between the ages of 9 and 17. These standards were based on 1,142,026 children and adolescents from 50 countries (representing 6 major geographical regions: Africa, Asia, Europe, Latin America and the Caribbean, Northern America and Oceania), extracted from 177 studies over the period from 1981 to 2014 . For the assessment of younger children we applied the most recent gender- and age-specific standards in European children aged from 6 to 9 . Both major studies applied the Leger et al. equation in order to predict VO2max. The software computes the percentile scores for the exact age (years, months) and estimated VO2max by linear interpolation. The following scale was applied to classify children’s performance from the 20mSRT and to observe those with a health risk: very poor (X < P10); poor (P10 ≤ X < P25); medium (P25 ≤ X < P75); good (P75 ≤ X < P90); and excellent (X ≥ P90) . This five-level rating scale is incorporated in the result section of the software, as shown in Figure 2. Moreover, other data, such as children’s height (H), weight (W) and maximum heart rate (HR) can be added and saved with the results. In addition, the software provides a convenient calculator which can be used separately in order to compute individual VO2max (ml/kg/min) and percentile scores after inputting the following variables: gender, age, number of the last stage and shuttle, and the running speed of the final completed stage. The statistical analyses were conducted with SPSS Statistics 19, using descriptive statistics, independent-samples t-test and Pearson correlation. Statistically significant differences between the average values were evaluated at p < 0.05, and all data in the text are presented as mean ± SD. Estimated maximal oxygen uptake (VO2max, ml/kg/min) and percentile scores of all participants are shown in Table 1. Whilst boys performed significantly better than girls in VO2max (47.7 ± 3.1 vs 45.9 ± 2.2 ml/kg/min respectively, p < 0.05), the percentile scores were, however, similar (53.2 ± 23.6 and 53.9 ± 22.1 respectively). A significant, negative correlation between the BMI Z-scores and VO2max in girls and boys (-0.54, p = 0.002 and -0.44 respectively, p = 0.011) was observed. The administration of the 20mSRT by BeepShuttle Junior is highly convenient and comprehensive, with a good audio-visual animation. The individual results and assessments exactly matched the interpolated normative data tables. There are different prediction equations for children and adolescents which differ in validity and can result in substantially different estimates of VO2max from their performance in the 20mSRT . However, normative studies which have provided the most recent international and European reference standards applied the Léger et al  prediction equation [7, 15]. Another significant issue is that there are often several different cassettes or CDs used for the same protocol when administrating the 20mSRT, and methodological variations on these cassettes (e.g. calling the stage number at the start as opposed to the finish of each stage, and using only full minutes rather than both full minutes and half minutes to indicate completed stages) which might lead to identical performances reported in different ways . Moreover, it is difficult to follow the shuttles and the speed for each individual properly when using cassettes or CDs. Furthermore, field-based test batteries, such as Alpha-fit and ASSO-FTB, do not refer to VO2max, but only to levels (stages) from the 20mSRT, which is not always an effective means of assessment. In addition, these reference standards have gaps in their values for younger children, which makes it more difficult to assess school children of all ages because of the need to further apply either country-specific or internationally available reference standards. Our software, BeepShuttle Junior, however, has the following advantages: it provides immediate assessment of cardiorespiratory fitness by using audio and visual signals, and calculates and assesses results (such as VO2max and percentile scores) of children and adolescents in accordance with comprehensive international norms. In addition, the software exports its results in files, which are compatible with Excel for further analyses. BeepShuttle Junior is highly convenient and comprehensive, with a good audio-visual animation, and it is appropriate for administrating the 20mSRT, in addition to calculating and assessing the results of individuals between the ages of 6 and 17, in accordance with comprehensive and up-to-date sets of gender- and age-specific international norms. The individual results and assessments exactly matched the interpolated normative data tables. This software can also be applied for health and fitness screening, profiling, monitoring and surveillance in schools and sports clubs. This research was financially supported by Grant ‘08/15.02.2018’ from the National Sports Academy, Sofia, Bulgaria. 1. American College of Sports Medicine, ACSM's Health-Related Physical Fitness Assessment Manual, Fourth Edition, ed. L. Kaminsky. 2014, USA: Lippincott Williams and Wilkins. 2. Plowman, S.A. and M.D. Meredith, Fitnessgram/Activitygram Reference Guide (4th Edition). 2013, Dallas, TX: The Cooper Institute. 3. Ruiz, J., et al., Predictive validity of health-related fitness in youth: a systematic review. Br J Sports Med, 2009; 43(12): 909-923. 4. Heyward, V.H., Advanced fitness assessment and exercise prescription. 5th ed. 2006, United States: Human Kinetics. 5. Tomkinson, G.R., et al., Secular trends in the performance of children and adolescents (1980-2000): an analysis of 55 studies of the 20m shuttle run test in 11 countries. Sports Med, 2003; 33(4): 285-300. 6. Tomkinson, G.R. and T.S. Olds, Secular changes in pediatric aerobic fitness test performance: the global picture. Med Sport Sci, 2007; 50: 46-66. 7. Tomkinson, G.R., et al., International normative 20 m shuttle run values from 1 142 026 children and youth representing 50 countries. Br J Sports Med, 2016. 8. Lang, J.J., et al., International variability in 20 m shuttle run performance in children and youth: who are the fittest from a 50-country comparison? A systematic literature review with pooling of aggregate results. Br J Sports Med, 2016. 9. Council of Europe, Recommendation no. r (87) 9 of the Committee of ministers to member states on the EUROFIT tests of physical fitness. 1987. 10. ALPHA, The ALPHA Health-related Fitness Test battery for Children and Adolescents, Test Manual. 2009. 11. Ortega, F.B., et al., Systematic review and proposal of a field-based physical fitness-test battery in preschool children: the PREFIT battery. Sports Med, 2015; 45(4): 533-55. 12. Bianco, A., et al., A systematic review to determine reliability and usefulness of the field-based test batteries for the assessment of physical fitness in adolescents - The ASSO Project. Int J Occup Med Environ Health, 2015; 28(3): 445-78. 13. Voss, C. and G. Sandercock, Does the twenty meter shuttle-run test elicit maximal effort in 11- to 16-year-olds? Pediatr Exerc Sci, 2009; 21(1): 55-62. 14. Leger, L., et al., [Aerobic capacity of 6 to 17-year-old Quebecois--20 meter shuttle run test with 1 minute stages]. Can J Appl Sport Sci, 1984; 9(2): 64-9. 15. Miguel-Etayo, P., et al., Physical fitness reference standards in European children: the IDEFICS study. International journal of Obesity, 2014; 38: 57-66. 16. Ortega, F., et al., Physical fitness levels among European adolescents: the HELENA study. British Journal of Sports Medicine, 2011; 45: 20-29. 17. Health and Social Care Information Centre, National Child Measurement Programme: England, 2014/15 school year. 2015: England. 18.	WHO, WHO Anthro for personal computers, version 3.2.2, 2011: Software for assessing growth and development of the world's children. Geneva: WHO, 2010. 2011. 19. BeepShuttle Junior. Software for assessing aerobic fitness. 2017 [cited Retrieved from STK SPORT, 2018; Available from: https://www.stk-sport.co.uk/beepshuttle-junior.html. 20. Leger, L.A., et al., The multistage 20 metre shuttle run test for aerobic fitness. J Sports Sci, 1988; 6(2): 93-101. Kolimechkov, S., Petrov, L., Alexandrova, A. & Cholakov, K. (2018). 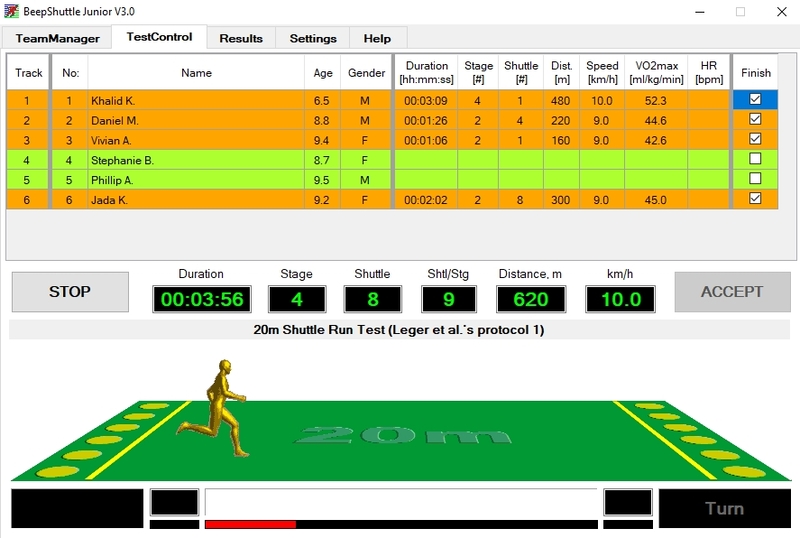 BeepShuttle Junior: Software for the Administration of the 20m Shuttle Run Test in Children and Adolescents. Journal of Advanced Sport Technology, 1(3), 35-40.